Replica of the Danzig Cross 2nd Class, formed by a white Maltese Cross and bear the Danzig coat of arms on it, the reverse is plain. The Danzig Cross was instituted on 31 August 1939 as two grade decoration by Danzig Gauleiter Albert Forster. 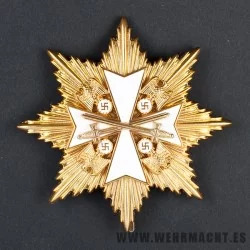 It was awarded to those who contributed to building up the Nazi Party in the free city.